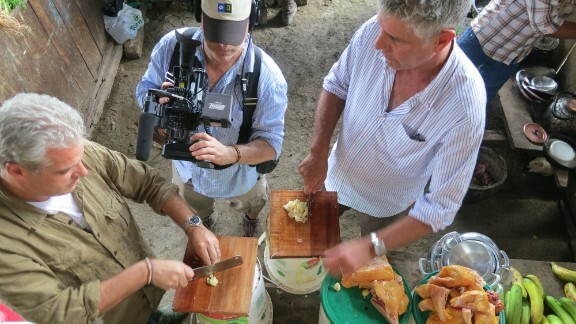 Anthony Bourdain travels to Lima to learn the correct way to make a Ceviche -- the national dish of Peru. There are a lot of very good reasons to go to Peru. 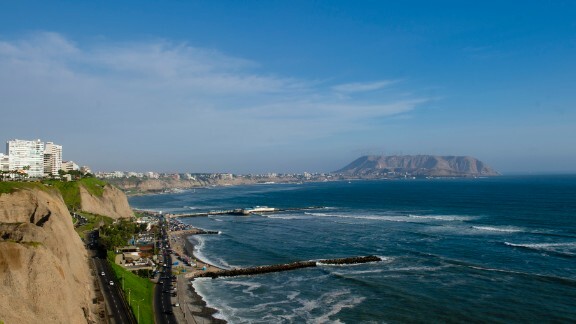 On a previous trip, I bounced around Lima, exploring the ever-changing, ever more exciting food scene -- from the more cutting edge fine dining restaurants, to the funkiest but most delicious traditional cevicherias. I've had many Pisco sours, huffed up mountains light-headed from altitude sickness, my cheeks stuffed with coca leaves. I've eaten guinea pig in Cuzco. Explored the jungle of Amazonia. Drank chicha with yucca farmers. I took ayahuasca in the middle of the night with a curandero, putted up river in a wobbly boat with imaginary bats screeching in my brain, lights that probably weren't there dancing in front of my eyes. I have looked out over Machu Picchu at dawn -- one of the most extraordinary experiences one can have in this life -- watched millions of cutter ants strip a forest floor clean, made friends, learned something about the world and about myself. So, I didn't really need a reason to go back. But this time, I had a good one. About a year ago my good friend Eric Ripert, the chef of the most excellent restaurant Le Bernardin in New York City, told me he had recently tasted the "best chocolate in the world" and inquired if I would be interested in getting involved in a probably foolhardy venture into the high-end chocolate business. There were these beans, he went on to say, high in a valley in a mountain range, somewhere in Peru -- cacao beans from wild trees, and recently, when their DNA was tested, they were found to be of a variety long thought to be extinct in their pure, non-hybrid form. Even more tantalizing at an even more remote location were an even more rare all-white variety. He'd been to see them, and his stories of high jungle adventure coupled with delicious, delicious chocolate were... enticing. Eric, as I knew well, likes chocolate. And as one of the best, most decorated, celebrated chefs in the world, he's had a lot of it. Guys like Eric? A lot of very fine wines come their way. Expensive ingredients like truffles, caviar, very old Cognacs. It's not just his business to know what the good stuff is; the good stuff finds him. What I'm saying is the guy knows his chocolate. So when he tells me that this Pure Nacional s**t from some little town in a remote mountain valley in Peru is the best he's ever had, I'm interested. We eventually come up with mix of chocolate and nibs in bar form, and next thing you know I'm in the chocolate biz. Thing is, it's a very boutique-y, very high end, screamingly expensive end of the biz. One of the only 7,000 bars we were able to produce (the whole year's supply sold off in just a few months) cost the nosebleed price of $18. Even reflecting the remote location, the rarity of the raw ingredient, the long trip from the mountains to the city to Switzerland and then to the States -- the whole artisanal process -- that's still a f**k of a lot of money for a chocolate bar. Was I doing a good thing? Is it OK to be in the chocolate business? I don't have any problem with wealthy people who can afford making impulse buys in expensive gourmet shops spending a lot of money on my chocolate. But where does the money go? In fact, where does this chocolate come from anyway? Just about everybody loves the stuff. It's everywhere. A fundamental element of gastronomy. But I knew so little about it. Where does it come from? How is it made? Most importantly, who does it come from? And are they getting a good piece of the action? Or are the producers, as in so many cases, getting screwed over? I very much hoped to find that whoever was growing our cacao was, at the end of the day, happy about the enterprise -- that life after Eric and Tony's Excellent Chocolate Adventure was, on balance, better than life before. So I invited Eric to take me back to Peru, up into the mountains, to follow the cacao trail all the way back to its source. There would be, as I was soon to find out, quite a journey ahead of me. Many miles of bad road, vigilantes to pay tribute to, swollen rivers to cross, the kind of mud that swallows whole trucks, shamans to get right with, planes, bridges, boats and ferries -- long hikes up steep, slippery slopes into the forest before we'd find our trees, hack open a few pods and see what it was all about. With a climate that ranges from desert dry to tropical lush to freeze-your-North-Face-off in the Andes, Peru packs a ton of diversity between its sea level elevation Pacific beaches and the 22,204 foot top of its highest mountain. Peru's bounty of fresh fish, roasted chicken, fiery chiles and sumptuous cacao packs so much flavor, it would be cruel not to share. See vibrant scenes from across the country.